Before purchasing your new pink belly side neck turtle, find the right breeders of captive bred aquatic turtles for sale. 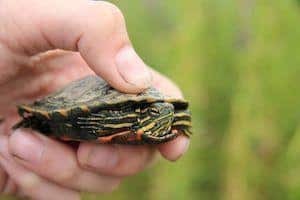 Whether it be a turtle store, or turtle farm, it is important you find the right turtle breeders selling captive bred baby turtle for sale only. Remember, not all water turtles for sale are alike! Some water turtles stay small, some get huge! All of our pink belly side neck turtles are 100% captive bred! Our pink belly side necked turtles are all captive bred and raised by hand in fresh, clean water. All of our pink belly side neck turtles come with our full live arrival and 7 day health guarantee. We always recommend the 6 month old or yearling well started pink belly side neck turtle over the new, more fragile fresh turtle hatchling for sale. Pink-bellied side-necked turtles are aquatic turtles, and spend most of their time in the water. They do require daylight, and do best in natural sunlight. If they are kept indoors, they need a full-spectrum light, or the combination of a 75-watt spotlight and a Vita-lite or other UVB bulb, during daylight hours. They do best in water kept at temperatures between 66 and 80 degrees Fahrenheit, although hatchlings need somewhat warmer water with temperatures in the low 70’s to low 80’s. The temperature of the turtles’ water can be monitored with a thermometer permanently affixed to the side of their tank. Remember when searching for any tortoise for sale, including a new baby tortoise for sale cheap, tortoise town is your source for the best cheap tortoise for sale , cheap baby tortoises for sale , baby box turtles for sale, and adult turtles for sale of any turtle store anywhere. If you are interested in tortoise care, please visit our care section.